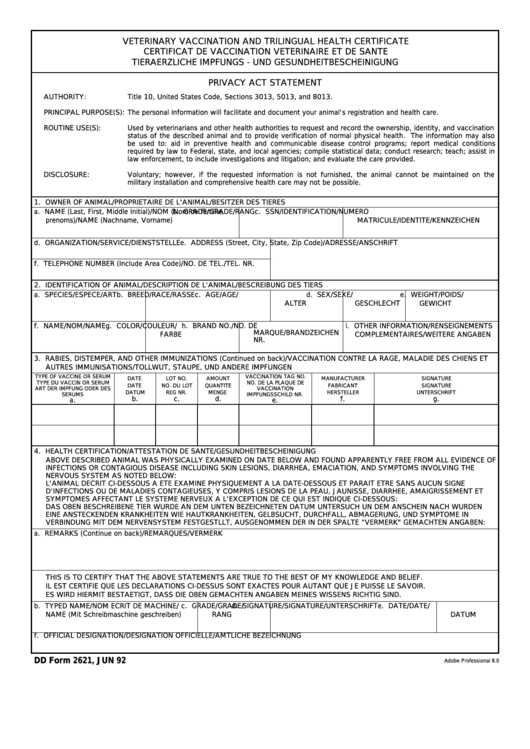 Download a blank fillable Dd Form 2621 - Veterinary Vaccination And Trilingual Health Certificate in PDF format just by clicking the "DOWNLOAD PDF" button. Complete Dd Form 2621 - Veterinary Vaccination And Trilingual Health Certificate with your personal data - all interactive fields are highlighted in places where you should type, access drop-down lists or select multiple-choice options. Title 10, United States Code, Sections 3013, 5013, and 8013. The personal information will facilitate and document your animal's registration and health care. law enforcement, to include investigations and litigation; and evaluate the care provided. military installation and comprehensive health care may not be possible. f. TELEPHONE NUMBER (Include Area Code)/NO. DE TEL./TEL. NR. THIS IS TO CERTIFY THAT THE ABOVE STATEMENTS ARE TRUE TO THE BEST OF MY KNOWLEDGE AND BELIEF. IL EST CERTIFIE QUE LES DECLARATIONS CI-DESSUS SONT EXACTES POUR AUTANT QUE JE PUISSE LE SAVOIR. ES WIRD HIERMIT BESTAETIGT, DASS DIE OBEN GEMACHTEN ANGABEN MEINES WISSENS RICHTIG SIND.